"We spend our time searching for security and hate it when we get it." — John Steinbeck. 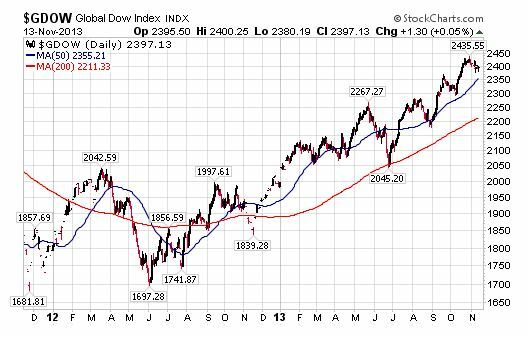 One of the basics of Dow Theory is the thesis of three psychological phases in both bull and bear markets. In a bull market, which we are now in, the first or initial phase is the early accumulation phase. This is the phase where wise and seasoned investors enter the market at or near the bottom, when many stocks are selling at great values after having been battered for months by the preceding bear market. Here many blue-chip stocks are selling "below known value." The second phase of a bull market is usually the longest and most deceptive, containing many secondary reactions. During the second phase the retail public shows interest in stocks, and enters the market carefully and sporadically. The third or speculative phase of a bull market is characterized by a wild and wooly and ever-increasing entrance by the retail public. This phase is characterized by hot tips, hype and pure greed. My experience with bull markets is that by the time investors have been tricked and fooled by second phase shenanigans, nobody is ready to think about the possibility of a third speculative phase. This is where I think we are now in this bull market. I believe that during the next 12 months we will experience a surprising and ever-expanding rush by the "mom and pop" public to enter the market. At the same time, veteran investors and institutions will seize the opportunity to distribute stock that they may have held for years. All primary movements are international in scope, and this bull market will be no exception. In proof I show one of my favorite items, the "International Dow" known as GDOW (consisting of all 30 Dow Industrials plus 220 international major blue-chip stocks. Note the sharp correction that occurs in mid-2012, and out of that correction the third, speculative phase of this international bull market began. I expect GDOW to go parabolic sometime in the next two years. In the meantime, I'm reading dozens of advisories and yes, I note the warnings and technical death traps that are offered by other services. No matter, I think the excitement and greed which has enveloped the retail public will trump the adverse technical warning indicators that are now making their appearance.